Sustainability, frequently defined as some balance between economic, social and environmental goals in urban development, is gaining popularity in city government. I have become interested in local government sustainability initiatives because cities often forge innovative partnerships with other government agencies, community organizations, private sector firms, and citizens in order to implement their sustainability plans. My research on urban sustainability can be found in journals including The Journal of Urban Affairs, Urban Affairs Review, Canadian Public Administration, Public Management Review, and Local Environment. How is sustainability defined within a city, and what are the consequences for local governance? Based on Q-methodology and eighty five elite interviews, my book analyzes how urban sustainability is defined in Baltimore. While some in Baltimore support a definition of urban sustainability that emphasizes environmental policies, other definitions of urban sustainability are more closely associated with urban revitalization or the city's civic health. My research on urban sustainability emphasizes that local political debate and policy definition are central to a city's sustainability efforts. 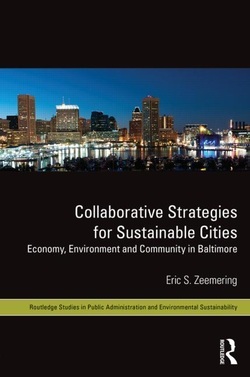 City government plays an important role in Baltimore's sustainability efforts and the book documents the establishment of the city's Commission on Sustainability and Office of Sustainability. Prominent community organizations that coordinate local environmental and economic development programs are also key player's in Baltimore's sustainability efforts. Local readers in Baltimore and community activists in other cities will be interested to learn about the wide range of community organizations that are undertaking environmental and economic development initiatives in local neighborhoods and city-wide. Social scientists will be interested to learn about the role of intermediary organizations, as well as the critical role that city government can play in developing collaborative strategy. Published by Routledge, you can find the book through the publisher, at ﻿amazon.com﻿ and other online retailers. The book is now available in hardcover and a more affordable paperback, ideal for personal reading and course adoption.